FREE SHIPPING! By USPS Ground. This sale is for the WHITE or Natural HATS ONLY. 3 Letter Monograms ONLY in this sale. Plus 1 Mrs. Hat. Name hats are listed in my etsy shop. OTHER COLORS MAY BE AVAILABLE! PLEASE SEND CONVO TO & check AVAILABLE STOCK! Custom designed! EMBROIDERED! HAND MADE HAT BAND AND BOWS! Mrs. Hat to include grosgrain Hat Band and Bow plus flower. Monogram will be new married name. 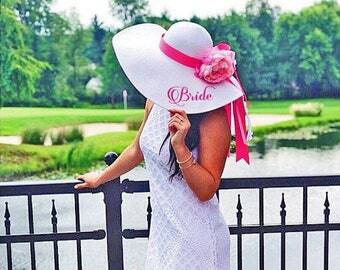 Bridesmaids hats are monogrammed with 3 letter monogram. Includes grosgrain hat band and bow. Flowers are not included. Specialty ribbons, laces, flowers (other than Mrs. flower) are not included in this sale. Send convo for quote. 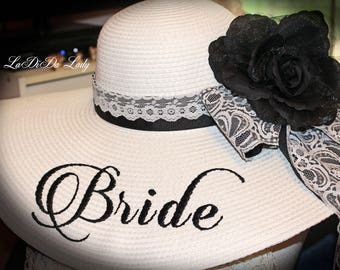 Hat bands, bows and additional flowers are removable and repositionable! Other colors may be a special order (may take additional time) or in stock! Just ask! 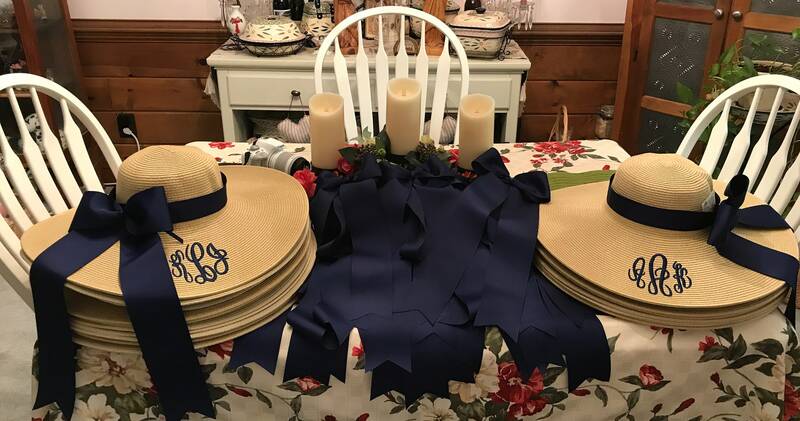 Bow colors are matched to your ribbon hat bands. Lovely Wide Brimmed Floppy Sun Bonnet - Gorgeous! We also have other colored hats listed in our Etsy Store. If you want a different color, just send a convo or email and I will set up a private sale link just for you! Approximate 21-22 inch head circumference. so please keep that in mind while choosing your fonts. Some fonts do not have lower case. You must & check your convo page for design pictures and send approval BEFORE your stitch out is started. Your delay may delay shipping. 1. Either purchase this sale or send convo to hat style & colors. Shipping by Priority mail only with confirmation :) We ship to verified addresses only unless other arrangements are approved prior to shipping and purchase. If your paypal address is not confirmed nor verified, you must do so before ordering or we cannot ship. Shipped within 1 week AFTER your design approval is received. Orders over $100.00 will require a signature.